This documentary seeks to establish the importance of public art across the United States through depicting the resurgence of art and culture surrounding the Barrio Logan neighborhood. It delves into the original artists' motives and aspirations to transform the park into a creative outlet for future generations, while maintaining it as a center for free expression. 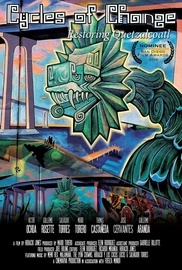 The story is told through the recollections of the original visionary artists who spontaneously began painting the Chicano Park murals in 1973. These key artists are the highlight of the film and the viewer acquires an understanding of the scope of their endeavours. We meet Victor Ochoa, the jolly versatile artist from San Diego and Tijuana, Mario Torero, the charismatic eccentric Peruvian-born artist, Jose Cervantes, the “unsung artist of the Chicano Art Movement,” Salvador “Queso” Torres, the stern protector of Chicano Park and lead original master painter, Tomas “Coyote” Castaneda, the cheerful artist and organizer, Guillermo Aranda, the spiritual painter whose Aztec roots flow into his work, and Guillermo Rosette, the dreamer who has helped re-create Chicano indigenous traditions.